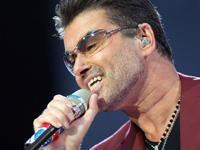 Georgios Kyriacos Panayiotou (George Michael) achieved fame in the duo Wham! in his native U.K. in 1982. Through 1986, he and his partner, Andrew Ridgeley, scored hit after hit in a variety of styles from rap to up-tempo pop to slow ballads. As songwriter and lead singer, Michael gradually overshadowed the group, and by the time they split, he was ready for a massively successful solo career. This began with the 1987 album Faith, which featured a series of chart-topping hit singles and sold more than seven million copies. That Michael had not achieved a similar critical success was evident from the title of his follow-up album, Listen Without Prejudice, Vol. 1, which must be considered a major commercial disappointment even though it sold a million copies, included two Top Ten hits, and hit number two. With Vol. 2 apparently shelved, Michael contributed several songs to the charity album Red Hot + Dance in 1992, and one of them, “Too Funky,” reached the Top 20.